The 8 Hour Enduro is not a race that you can just show up to like a normal club race. Strategy and proper preparation are immensely important if you want a chance at finishing, let alone winning the race. This being our first time, it was a huge learning experience for our team. 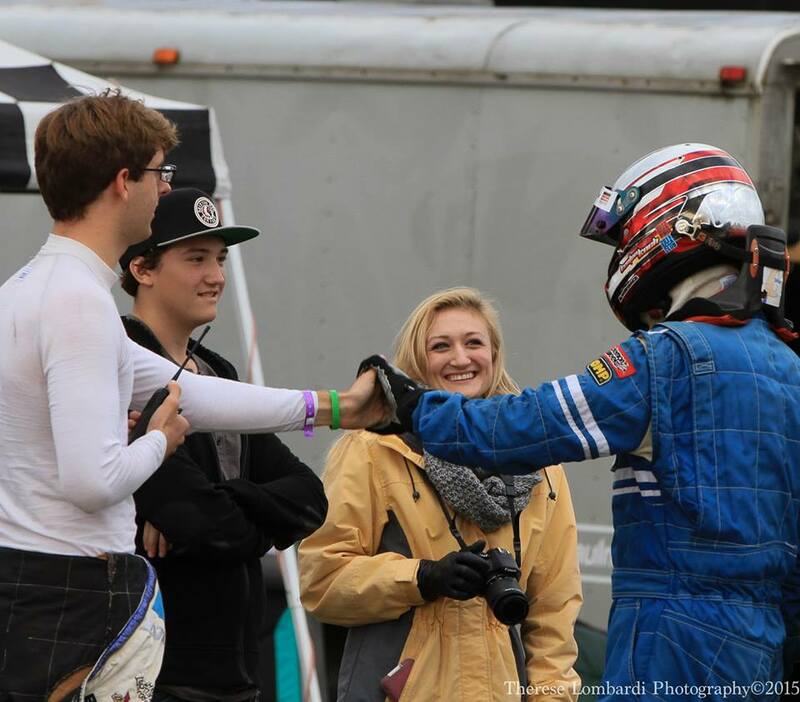 The team wishing Tom luck before he gets in to drive. Our preparations began just a couple of months prior to the race. Dad (Tom) worked on going through the car to make sure it was mechanically sound, checking all of the nuts and bolts, and changing anything that might not make it all 8 hours. We collaborated to figure out a light system to use during the night hours (the back side of the track gets VERY dark), find crew members, and develop a pit strategy. 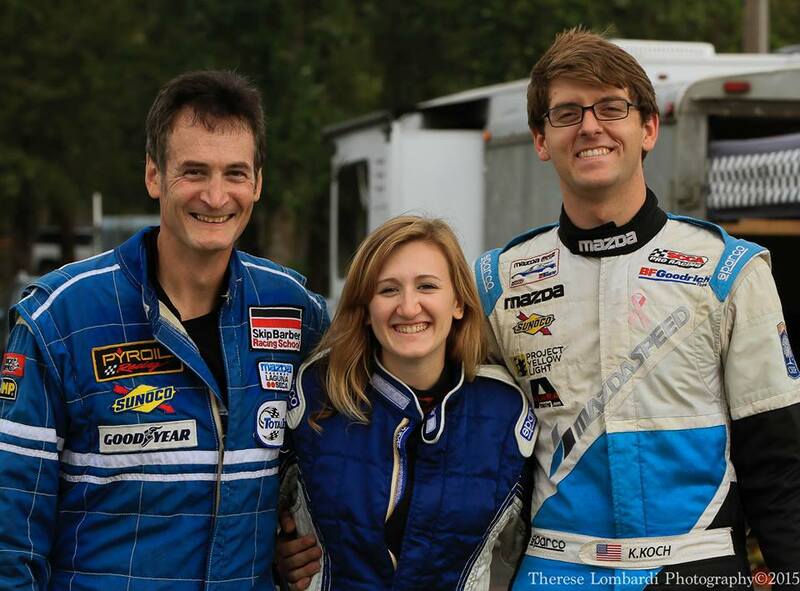 Our three drivers, Tom, Dani and Kenton, showing pre-race excitement! Our driver line up included my Dad, our "pro driver" Kenton Koch, and myself. 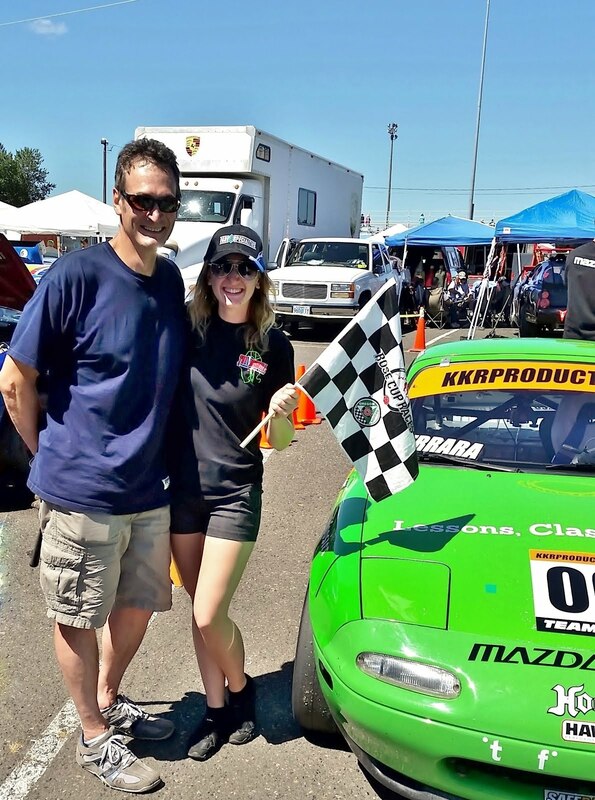 The rest of our family wanted to be involved as well, so we put Mom (Daria) on the fire extinguisher for fuel stops, my sister (Tara) baked cupcakes for the team and made sure we were happy, and brother (Chris) was in charge of our whole operation from behind the pit wall. We also were lucky to have Vincent Melon and David Jackson join our team, with David as our fueler, and Vincent as a dedicated crew member who quickly showed his knowledge and organization, so we nominated him as our Crew Chief. This race features a special component: the Le Mans Start, where starting drivers line up along the outside pit wall and upon sound of the whistle, run to their cars in a race to get out of the pits first. Kenton lined up as our starting driver. At the sound of the whistle, he bolted to the car as I helped him quickly strap in. As soon as I shut the door, he started the engine and was off! We were the first ones out of pit lane, and immediately gained a 30 second lead on the second place car in our class. From then on, it was about maintaining a quick pace and making smart passes. Kenton drove a fantastic first stint, giving us a solid lead over second place. First pit stop for Ferrara Racing with fuel and driver change - Kenton out, Dani in. Our first pit stop was a huge learning lesson. We quickly found our fueling method put us at a huge disadvantage compared to our experienced competitors with their quick-fuel jugs. After the first stop, we lost our lead. I strapped into the car knowing I had time to make up. For the next 1.5 hours I raced clean and held onto our second place position. 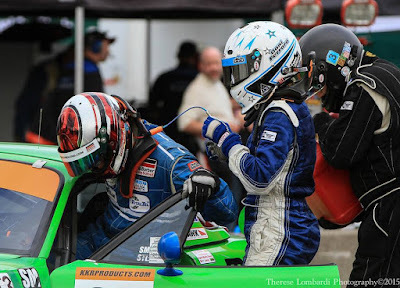 I pitted for our next fuel stop and driver change, swapping seats with dad, who would go out for a double stint lasting about 3 hours. Endurance racing adds another layer of complexity due to the significant difference in the speed of cars on track. With the leaders lapping the field every 4 or 5 laps, slower cars (such as our Spec Miata) must check mirrors often to ensure we don't get run down by the faster cars. Driver change - Dani out and helping Tom belt in. About halfway through the race the car developed a vibration that worsened as we went into the night. Coming in for our next driver change, dad handed the car back over to Kenton, commenting to take it easy on the curbs to preserve the car. With a couple hours left to go, we got word from officials that corner workers in turns 4, 6, 8 and 12 (basically all of the manned stations) were reporting loud, concerning sounds coming from our car. We confirmed with our driver, "Yeah, it's loud but drives fine." Sunset over Portland International Raceway during the 8 Hours of the Cascades. Kenton came in for our final pit stop with about 45 minutes left in the race. The car rumbled and squealed to a stop and we understood why the officials had expressed concern: it sounded like it might explode! By then, our top competition had fallen out of the race due to engine issues and we had a three lap lead over second place. All we had to do was finish. As I belted in to finish the race, Kenton assured me that the car drove fine. Pit stop under the lights with fuel and driver change - Tom out, Kenton in. Those last 45 minutes felt like forever. Through every turn the car made loud rumbling sounds which translated to a huge vibration going down the straight. With 15 minutes to go, there was a loud clunk and the sound we had been hearing for hours went away. I reported to the team, "Big clunk and now the sound is gone - the vibration is better too...Whatever it was, I think it broke. Still drives fine." They replied, "Just keep driving!" Amazingly, the car held together to the end. It is an incredible feeling to come to the checkered flag after 8 hours of racing in first place. The Ferrara Racing team celebrating after winning the race! Thank you, thank you, thank you to our team and everyone who lent us a hand throughout the race! Dani to Drive for Team KBR in 2014!